1 Introduction. 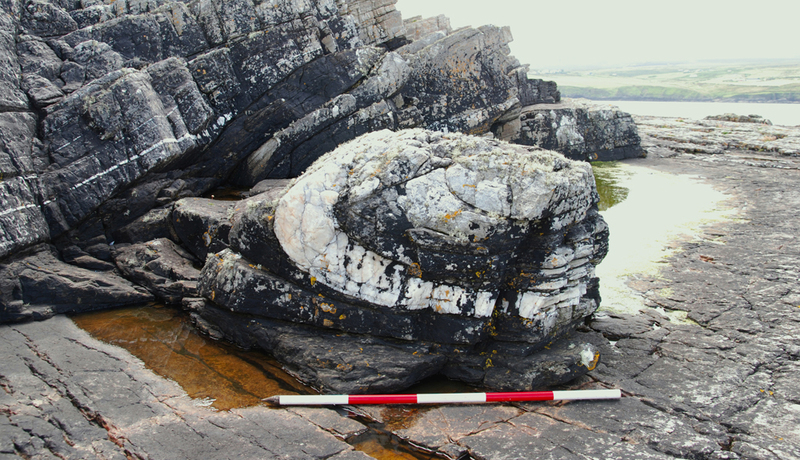 Understanding quartz technology in early prehistoric Ireland. 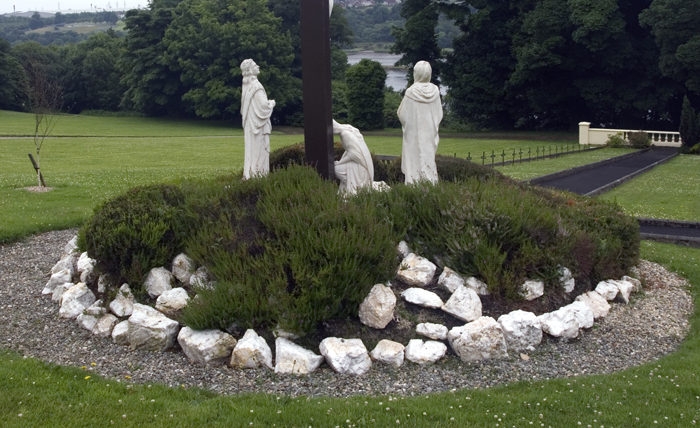 In the Irish landscape today, vein quartz is a common sight in sacred Christian settings, whether as boundary stones around statues (Figure 1-1), or as gravel coverings over graves. This use of quartz in ecclesiastical contexts has a long tradition, stretching back to the beginnings of Christianity in Ireland, with references to quartz in early medieval texts and later folklore, as well as from the archaeological record (see Thompson 2004). Importantly, the use of quartz in Christian Ireland followed from pre-Christian traditions, with quartz especially noted as deposits and architectural components of megalithic structures, most famously by the reconstruction of the surmised façade of quartz boulders at the Newgrange passage tomb (see Cooney 2000). This project, however, has approached the use of quartz in prehistory from a different and less discussed perspective. The present focus of research is on the use of quartz in the stone tool traditions of the prehistoric communities in Ireland. 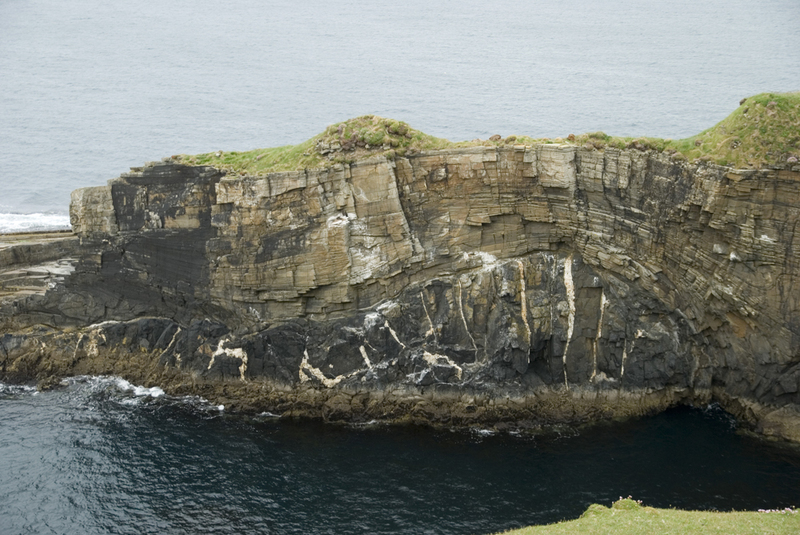 Quartz was commonly a part of Irish prehistoric lithic repertoires, with evidence of its use found throughout the island. As the opening quote highlights, however, quartz is a particularly difficult material to analyse. The traditions of antiquarian and archaeological research in Ireland and elsewhere were founded on the collecting and investigating of cryptocrystalline rocks such as flint, with, over time, a variety of attributes noted as signifying humanly-made tools. Vein quartz, especially the more commonly available coarse-grained vein quartz, does not fracture in the same manner as cryptocrystalline materials. This, therefore, can lead to difficulties in the identification and interpretation of quartz artefacts in analytical traditions that are founded on the basis of the fracture mechanics of cryptocrystalline materials – a consequence of these difficulties is an under-acknowledgement of the extent of prehistoric quartz stone tool use. The collecting of flaked stone artefacts in Ireland is firmly a story of flint, thus leading to these problems in quartz analysis. Flint has featured centrally in researchers’ ponderings, so much so that the Antrim flint deposits were seen as the lynchpin of Irish prehistory and even by some as the raison d’être of the post-glacial colonisation of the island. However, many other materials were used for lithics in prehistory and Chapter 2 sets out a history of lithic research in Ireland, with a focus on how researchers in the nineteenth and twentieth centuries comprehended and assessed the flint-alternative raw materials used in prehistoric stonecraft in light of the dominance of flint in the archaeological record. While Chapter 2 presents a general history of Irish lithic research, quartz-focused Irish research is reviewed in Chapter 3. Chapter 3 also presents the results of a database of quartz lithic artefacts constructed at the outset of this project. The review has highlighted the challenges of analysing quartz and that quartz as a viable raw material for stone tools has been under-appreciated, while the database has highlighted that the true extent of quartz artefacts in the archaeological record has been underestimated. The difficulties in identifying quartz notwithstanding, this material has been found on a wide variety of archaeological sites, suggesting that the use of the material for stone tools in prehistory was considerable and widespread. Chapter 4 reviews how researchers from outside of Ireland have used a variety of approaches to analysing quartz. From this literature search, it is clear that despite quartz often being the predominant raw material in the respective regions, quartz research has been neglected. Two broad camps of quartz researchers are noted, with one arguing that quartz can be analysed in a framework devised for flint and the other arguing that a separate framework should be devised based on the fracture characteristics of quartz. Examples from America, Africa, and Scotland of classificatory frameworks such as attribute analysis and reduction sequences are discussed, followed by a review of researchers who have conducted experimental knapping, some use wear projects, as well as an experiment on the identification of retouch conducted on quartz. While most of these researchers focused on a more economic and technical view of technology, the symbolic and ‘non-utilitarian’ aspects of quartz are an integral part of prehistoric quartz use and are also covered in Chapter 4. The approach taken in this project has been the experimental knapping of a variety of sources of vein quartz, using a variety of methods of stoneworking used in prehistory. This has created an experimental assemblage of artefacts with which to devise a framework for analysing quartz assemblages from two case study excavations. Chapter 5 introduces the methodology of the project, beginning with conception of the sociality of technology, outlining my understanding of this and the implications it has for my methodology. This is followed by a discussion on the general methodology, the chaîne opératoire, used in this thesis and how this relates to a social archaeology perspective. Typological and terminological considerations are then discussed. The following sections then introduce the petrographic analysis undertaken, the knapping experiments, the quartz recognition experiments undertaken on participants at the Belderrig excavations and the World Archaeological Congress (WAC) in Dublin, the experiment with burnt quartz, and finally, the two case studies. The knapping experiments which form the main pillar of the thesis are detailed in Chapter 6, beginning with the selection and collection of the raw materials used, and the results from the thin sectioning of the material. The following section outlines the experiments, discussing the experiments’ organisation and recording; describing the measurements, equipment, and sampling strategy used for the resultant assemblage; and definitions of the debitage categories used. The next section presents the analysis of the experimental assemblage followed by an overview and discussion of the experiments and results. Chapter 7 discusses the two quartz recognition experiments conducted on volunteer participants at the Belderrig Summer 2008 excavations and at the WAC conference, Dublin 2008. These two related experiments, which were dubbed as ‘quartz quizzes’, were undertaken in order to understand how quartz artefacts are indentified and classified by different people. The chapter introduces the reasons for the quizzes, discuss the considerations and decisions regarding the formulation and conducting of them, and introduces some previous research pertaining to examining researchers’ consistencies and biases in analysing and classifying artefacts and interobserver biases. This is followed by an analysis of the experiment, and an overview and discussion of the chapter. Chapter 8 details the experimental burning of a quartz assemblage and the subsequent thin sections taken on burnt and unburnt samples, beginning with a discussion of previous research and the selection of material, measurements, and the fire setting for the present experiment. The chapter then details the results of the experiment and the thin sectioning, covering the effects on the appearance of the quartz, its fragmentation, and the spatial distribution of the material in the hearth and beyond. The chapter concludes with an overview and discussion of the results. Chapter 9 details the analysis of a part of the Belderrig quartz assemblage, introducing the excavations at Belderrig, Co. Mayo and describing the geological and palaeoenvironmental context of the area pertinent to the Mesolithic and Neolithic periods. The analysis of the assemblage begins with the condition and sources of the quartz followed by analysis of the cores and debitage for all contexts, with individual contexts subsequently detailed. The non-quartz component of the assemblage is then described, followed by an overview and discussion of the analysis. Chapter 10 details the analysis of the quartz assemblage from the Thornhill Neolithic palisaded enclosure, beginning with an introduction to the excavation and the main features, followed by a brief overview of other excavations and finds in the vicinity and the geological and palaeoecological background to the area. The analysis of the quartz assemblage begins with the condition and sources of the quartz, followed by a brief overview of the contexts containing quartz. The analysis proceeds by covering the cores and then the debitage, followed by the diagnostic types. The main quartz-bearing contexts are then presented, followed by a comparison to the non-quartz assemblage (which was analysed previously by Nelis (2004)), and an analysis of the chaîne opératoires of the quartz component, with the chapter concluding with an overview and discussion of the assemblage. Chapter 11 concludes the thesis with an overview of the various strands of research undertaken. Volume 2 presents the appendices and the excavation plans. The appendices are divided into two groups. Appendices A1-A113 are the various tables of data and other sundry appendices, while Appendices B1-B26 present photographs of the lithics from the knapping experiments, the Belderrig excavation, and the Thornhill excavation and are grouped in this manner to facilitate comparison. A glossary of terms used in the thesis are presented in Appendix A-1. The remainder of this chapter discusses the characteristics of quartz in Section 1.2, the data sources used in Section 1.3, abbreviations used in Section 1.4, and the archiving of the thesis material in Section 1.5. Quartz is silicon dioxide (SiO2) and is the most common mineral on earth and a significant component of many igneous, sedimentary, and metamorphic rocks. Quartz is a hard but brittle mineral which makes it suitable for forming into stone tools and subsequent use. In terms of fracturing, almost all quartz does not exhibit cleavage – which means it does not have a tendency to break along structural planes in the crystal structure – but is instead characterised by conchoidal fracturing, which means that its fracture surface has a curved shape. Quartz can be broadly divided into cryptocrystalline and macrocrystalline forms. - Cryptocrystalline forms include flint, chert, and jasper, and are described as rocks instead of minerals (as they have less SiO2 in their composition). The conchoidal fracturing of the cryptocrystalline materials happens at the micro-scale of the individual quartz crystals and at the macro-scale, following a fractal pattern (Idorn 2005). - Macrocrystalline forms include vein quartz and rock crystal (Anon. 2009); while these fall under the umbrella of ‘lithics’ and ‘stone tools’ in archaeological parlance, they are in fact minerals. The fracturing at the micro-scale is conchoidal, but a fractal pattern may or may not be produced depending on how the crystals have aggregated. The most common formation of macrocrystalline quartz is through the cooling of hydrothermal solutions or molten rock. The cooled quartz from hydrothermal solutions can form as veins in large or small cracks in rocks (Figure 1-2 and Figure 1-3). The conditions (i.e. pressure, time, and position in associated rock) under which the hydrothermal solution cools affects whether the macrocrystalline quartz can form as automorphic or xenomorphic quartz. - Automorphic quartz implies that during formation the quartz crystals have been able to form into a recognisably crystal shape, i.e. that the crystals are euhedral. Thus transparent rock crystal is formed; other varieties include the purple amethyst whose colour is caused by impurities. - Xenomorphic quartz implies that during formation the quartz crystals have not been able to form properly and are “formed through the aggregation of several microcrystals, but macroscopically, ha[ve] a solid structure” (de Lombera Hermida 2009, 7), i.e. the crystals are anhedral. When xenomorphic quartz forms as an aggregation, the habit (the general appearance) is termed massive habit (with ‘massive’ not signifying size but rather signifying the anhedral structure). This aggregation of quartz crystals can be formed by a range of crystal sizes which are termed grains – the xenomorphic quartz can therefore range from fine-grained to coarse-grained quartz. The vast majority of vein quartz forms as xenomorphic quartz, but under certain circumstances automorphic quartz can form within veins of xenomorphic quartz, i.e. quartz with a clear crystal structure, and these can range from very small to large crystals. The boundaries of xenomorphic quartz can often have small or large automorphic quartz attached. These veins are not necessarily stable, as subsequent tectonic activity can create conditions for the quartz to re-crystallise in different forms depending on the conditions. The initial formation and any subsequent tectonic activity can create internal flaws defined as planes (de Lombera Hermida 2009). It is these planes rather than cleavage that is important in knapping and quarrying quartz (for quarrying see Ballin 2004) – these planes can be seen in Figure 6-2 and Appendix B-1. Together, the plane and the grain of the quartz have important implications for the use of quartz in lithic technology in terms of how it will fracture during knapping and withstand stresses during subsequent use. For example, a very fine grained quartz with no plane may in effect fracture similarly (conchoidally) to cryptocrystalline quartz such as flint, while more coarse grained quartz with planes or no planes will fracture irregularly with less clear conchoidal fracturing; rock crystal will also fracture conchoidally, but with differences to cryptocrystalline materials (as noted by Reher and Frison (1991), see Section 4.3). While a convenient division of quartz used in stone tool technologies is between vein quartz (xenomorphic) and rock crystal (automorphic), in fact vein quartz is primarily xenomorphic quartz but can have automorphic quartz attached to it or within the vein. This may range from tiny crystals to more substantial ones. De Lombera Hermida (2009) suggests a fourfold division, depending on the absence or presence of grain and plane. Nevertheless, the division between vein quartz and rock crystal suffices in general terms, allowing that ‘vein quartz’ is not homogeneous. Consequently, this project has focused on the experimental knapping of vein quartz, and has not sought to experiment with rock crystal knapping. Generally, I use the term ‘quartz’ as shorthand for vein quartz. A variety of data sources has been used for various parts of the project, including topographical data and data on monuments and artefacts. A number of sources was used to create the maps; when needed, these datasets were amended and/or corrected in order to correspond more accurately to the data being displayed. The following were used in addition to data gleaned from the general literature. Data from the National Museum of Ireland archives was extracted for the database - this involved locating the coordinates for each findspot or townland concerned, thus creating a spatial distribution for the artefactual material. In order to avoid the repetitive use of various phrases, a number of abbreviations particular to this thesis, and commonly used statistical abbreviations, have been used and are outlined below as well as explained in the text. Five databases were constructed for this project using Access 2007. Due to the large amount of entries in these databases, they are not presented in a hard copy format in the Appendices. Instead, electronic copies of the quartz finds in Ireland database and the three experimental work databases are provided in Excel format on the accompanying CD-ROM, which also includes a pdf of the thesis, and an interactive map of the quartz finds in Ireland database, and the application to view the interactive map. The databases and thesis will also be archived electronically. Details of the location of the digital archive can be requested from the School of Archaeology, University College Dublin. The experimental knapping and burning artefacts will be available for researchers; details for viewing this material can be sought from the School of Archaeology, University College Dublin.